Fancy finding this at your local scrappie? 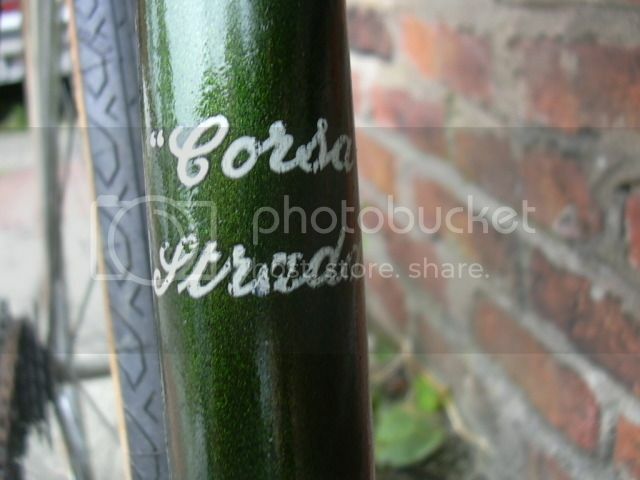 A Worksop built Carlton Corsa Strada made from some obscure butted lightweight tubing. It is not Reynolds 531, but it feels light. 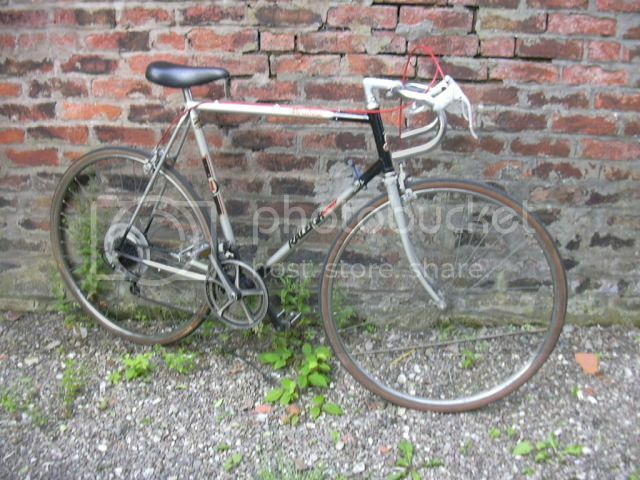 27" Rigida Superchromes in 32/40, that neither sport super chrome, nor did they turn out being rigid - they are both buckled. 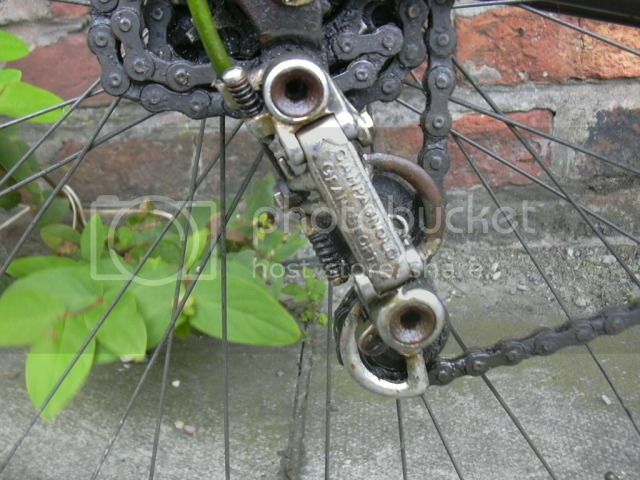 Campagnolo shifter and chain sideways bender. The Baron said: " That overhyped rubbish. Steer clear of anything made in Italy." 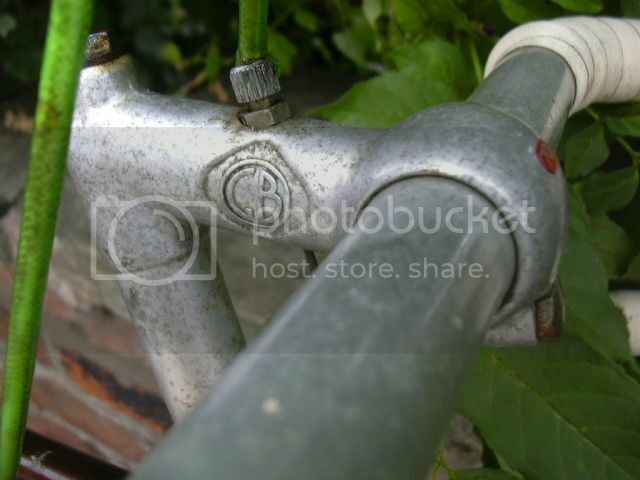 GB forged aluminium headstem and GB aluminium handlebars. Weinmann Vainqueur 999 centre pullers, pretty useless, but the Baron thinks they are still better than what Burt Munro had for deceleration. He said: "Those bloody brakes only slow you down". 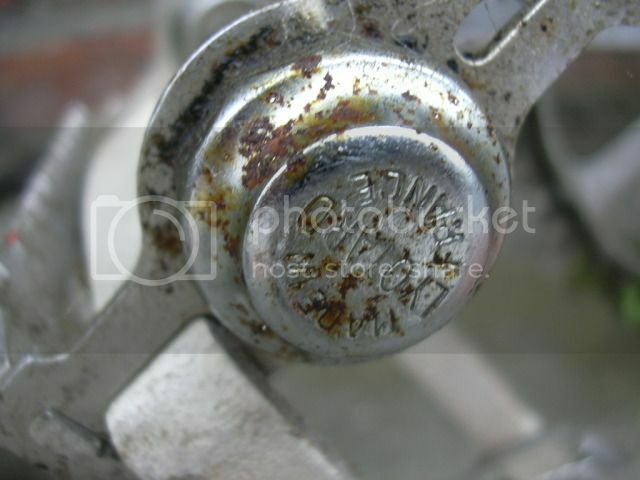 Original 'Carlton' brake lever boots in good condition (uberw00t!). GB stainless mantraps. The Baron: "They have to go. As much as I loathe those Health and Safety whimps, I'm not really suicidal either". 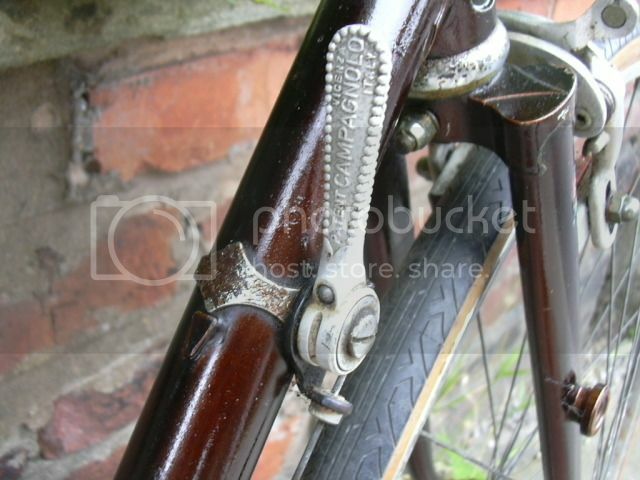 Replace handelbar tape with brown textile and shellac it, Champagne cork bar ends. Replace cables and use brown outer casing. 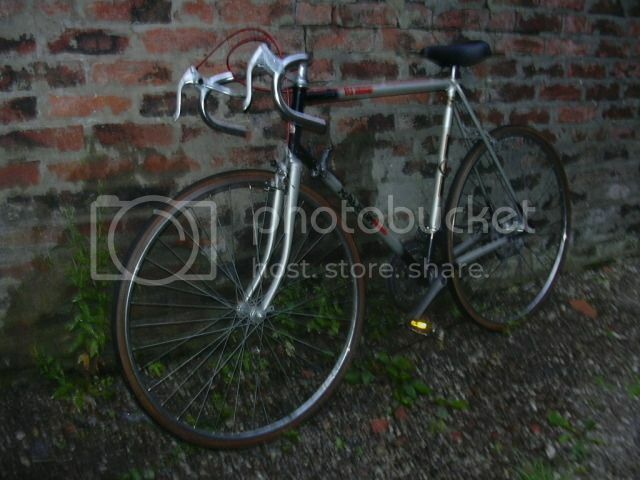 Replace wheels and tyres. 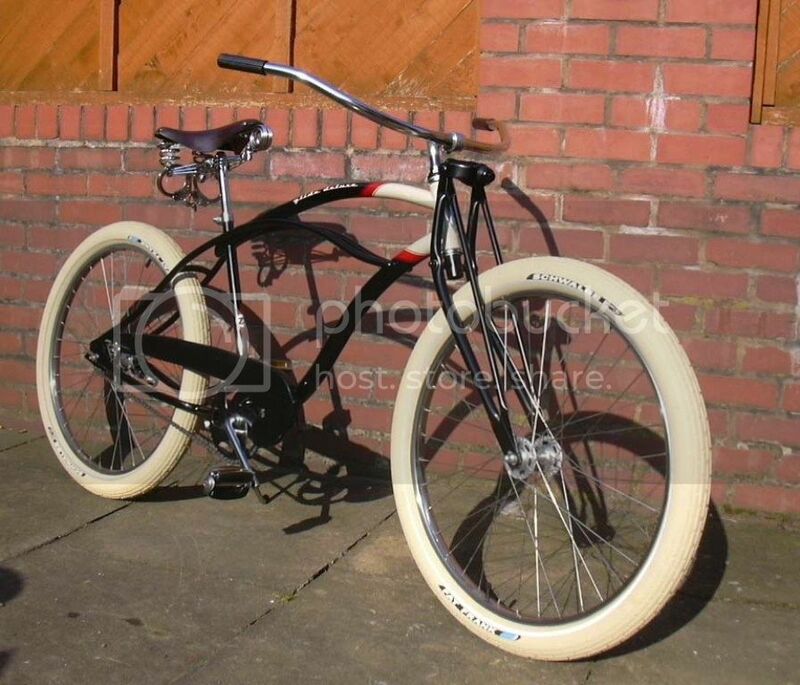 The Baron says, tyres aren't a problem, he has 27" slugwalls somewhere in the stack. The problem really is with the wheels. A major problem that is. 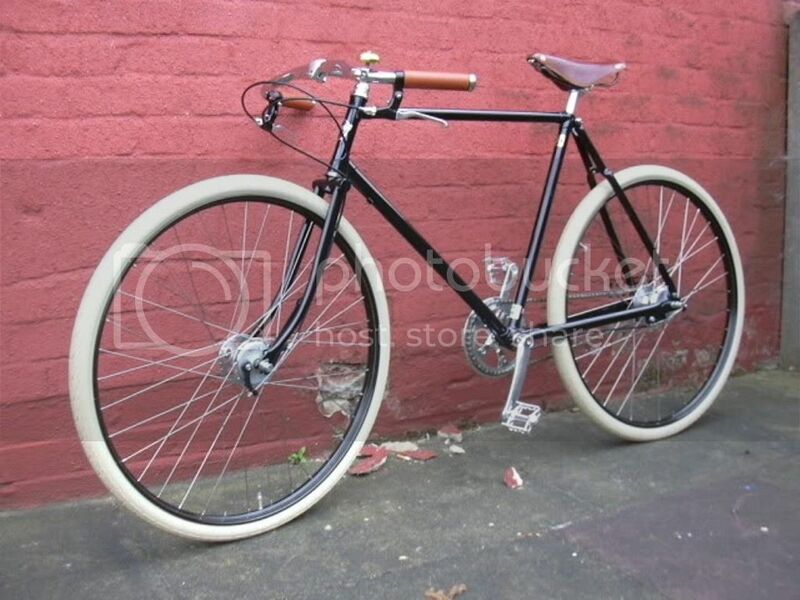 He has several sets of 32/40 large flange hubs which would look ace, but rims in 32/40 are made of unobtainium nowadays. There are relatively cheap but beautiful polished aluminium rims available, but only in 36h. This would have the inherent disadvantage, that the Baron ends up with four spokes short in the back, and four too many oop front. He said: "An unacceptable proposition". He continued: "But I don't have a reputation of finding anything for nothing. If I can't find it, they didn't make it!" 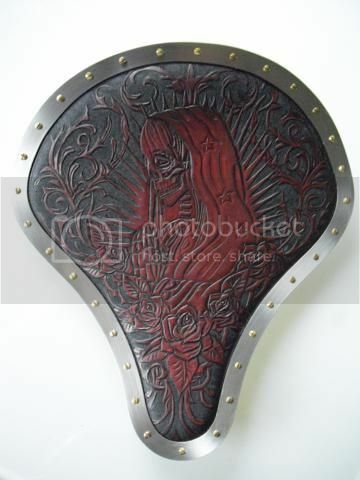 "Oh, and that stupid reflector that makes one look like a total retard has already been ritually tossed". 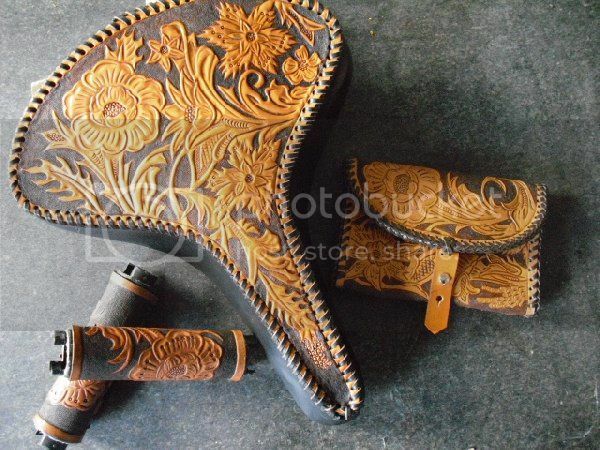 Subsequently, the bike has taken on a decidedly Western flair. This wasn't really intended when the Baron set out to build it, it just turned out that way somewhen along the line. 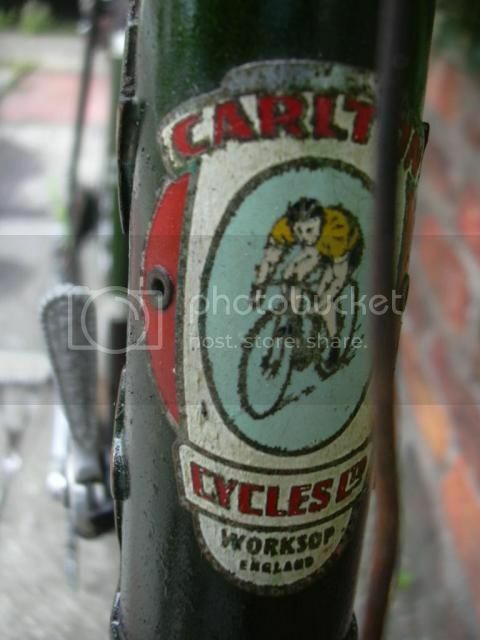 But it is living proof of what the Baron always claims: "Bikes have a soul and personality. If you just let them develop like they want, you will automatically end up with the right result." He added: "Apart from that, there is a trend towards slugwalls anyway and after six years I just couldn't see those cheesy cream Fat Franks anymore." "Because I'm putting slugwalls on, and I am the Baron. So soon everyone will do it." The Baron's newest foray into the Reich of the pitted chrome, the perished slugwalls, and the peeling stickers is a Raleigh Winner. Oh don't we all adore it? 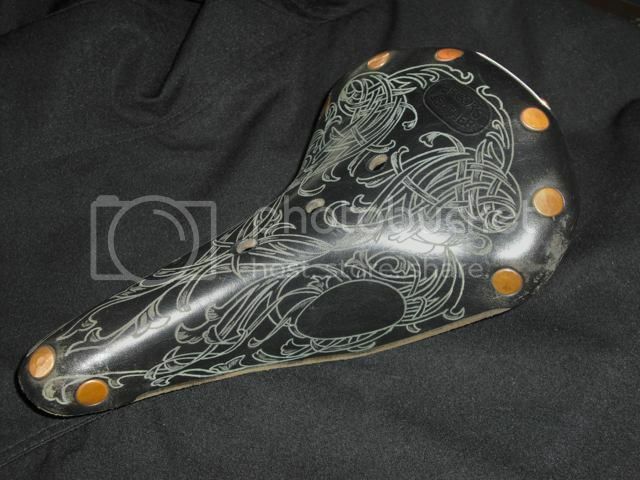 Gone is the hideous rubbish made from a hideously newfangled material they call "plastic", the heater pipe insulation they used on the handlebars (no kidding! ), and the various reflectors the poor thing was festooned with. Bloody safety, you know. It's the bloody law, you know. The Baron said: "I just had to remove all this rubbish. Just can't see that ruddy stuff on it. 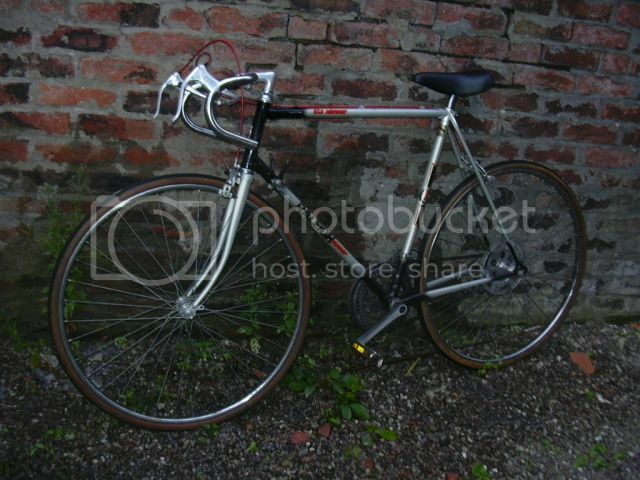 With it, the bike looked like something Graham Norton would ride". 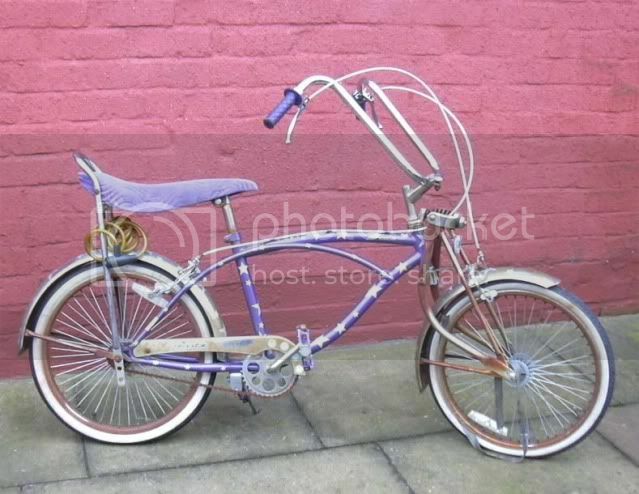 Pumping up the tyres was all that was needed to make this bike fully functional! Why people just toss something like this is beyond the intellectual capabilities of the Baron. Not sure how old it is. It's on 27" Rigida Superchromes and has Weinmann sidepullers. 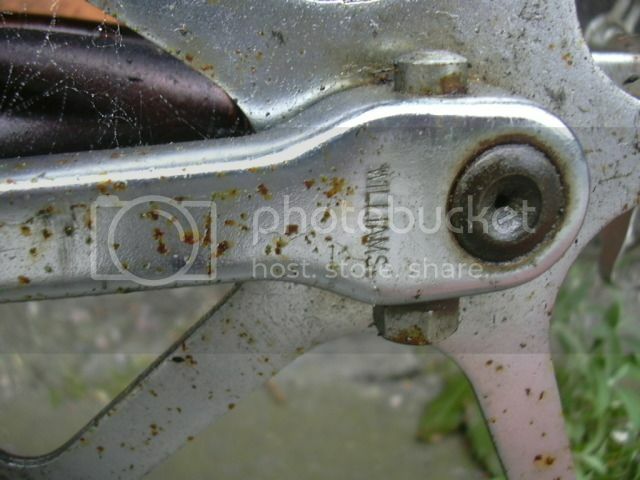 It is pre Shitmano era, the chain twisters are Simplex ones. 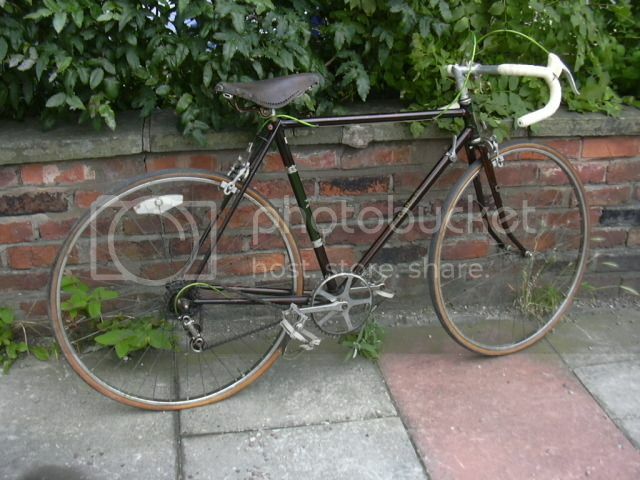 The chainset looks rather newfangled though (The Baron is old enough to shrug, when someone says 'vintage' in conjunction with stuff from the 80s. For him, that's newfangled), but it could have been added at some stage. What do the experts say? 70s? 80s? Because he is the Baron. That's why. Q: Why do people buy diamonds? A: Because they are expensive. 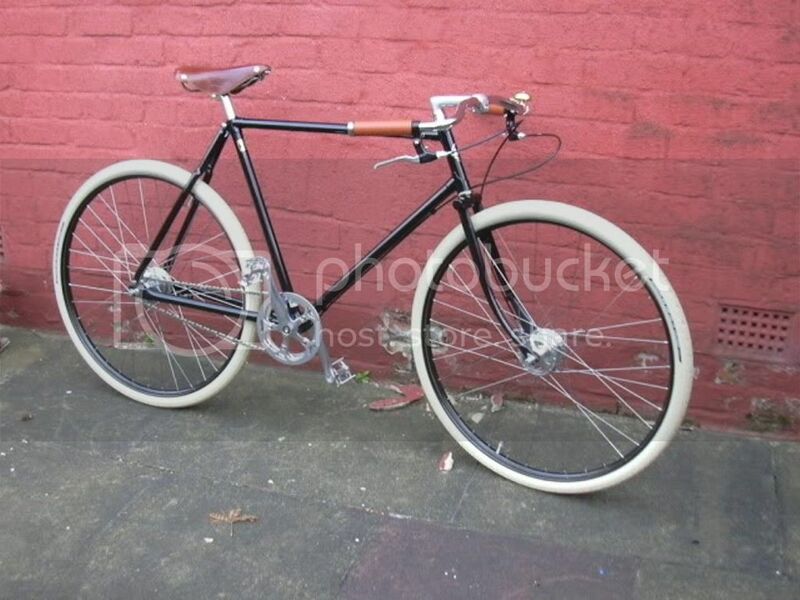 The same applies to a Pashley Guv'nor. 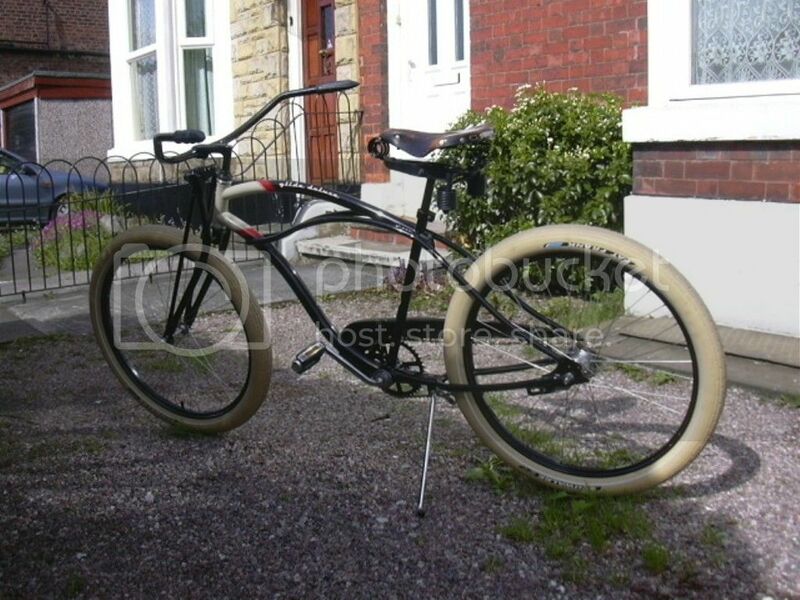 Pashley claims, it is a re-enaction of a path racer they built in the 1930s. Do not misinterpret this. 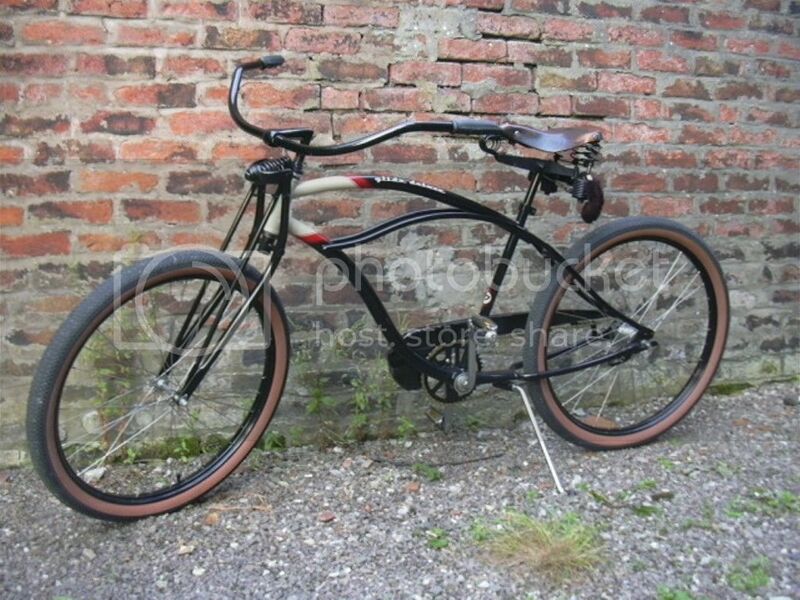 It means, it is as atrocious to ride as a path racer from the 1930s. Why they call the frame geometry 'relaxed' is beyond anybody's guess. 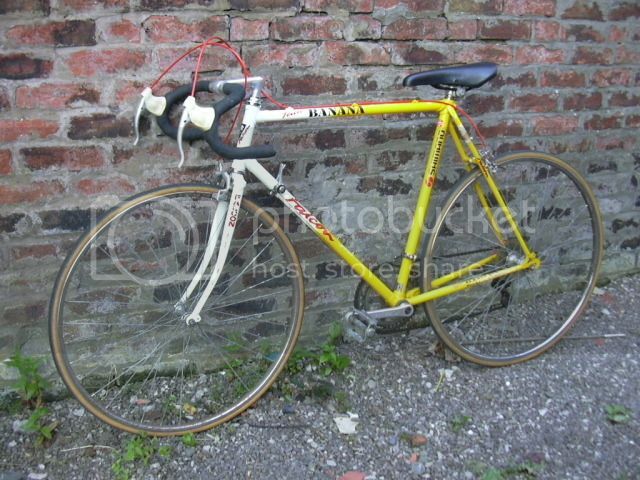 Technically, the Guv'nor is a quarter century away from the pinnacle of bicycle development, which took place in the 1950s. 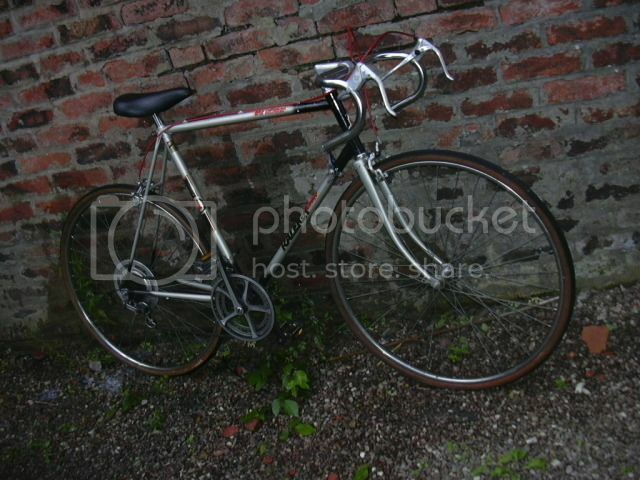 What had been developed by the end of that decade stood until the 1990s, when bicycle technology suddenly took a turn for the worse, which is ongoing to this day and led to the shite most people let rot away in their garden sheds while using their cars. 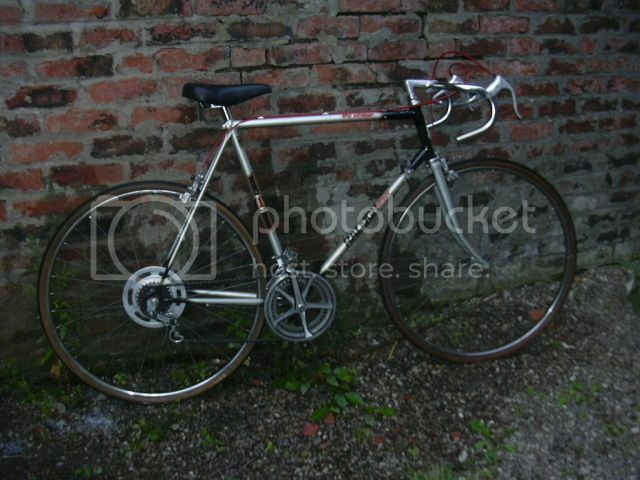 I don't blame them for that, because most are ignorant of what a bicycle really can be, being born long after the last real bicycles were made. 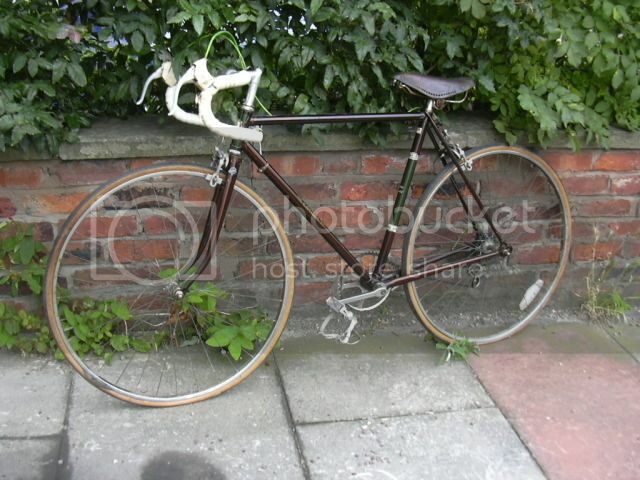 However, the 1950s are 52 years old now, so the Guv'nor is actually closer to the pinnacle of bicycle development than todays rubbish, I give it that. 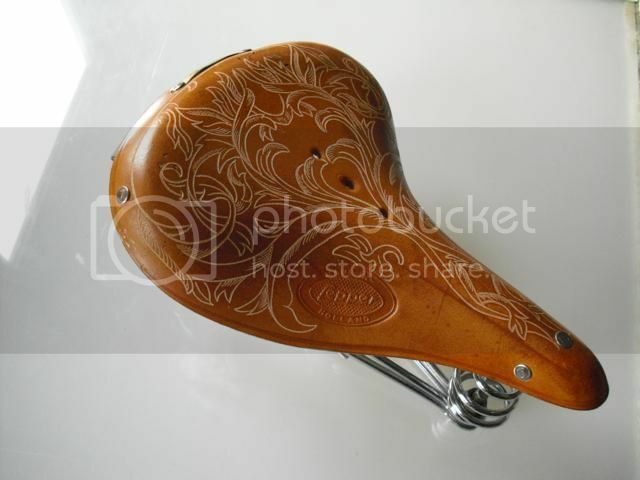 It is made from Reynolds 531 tubing. 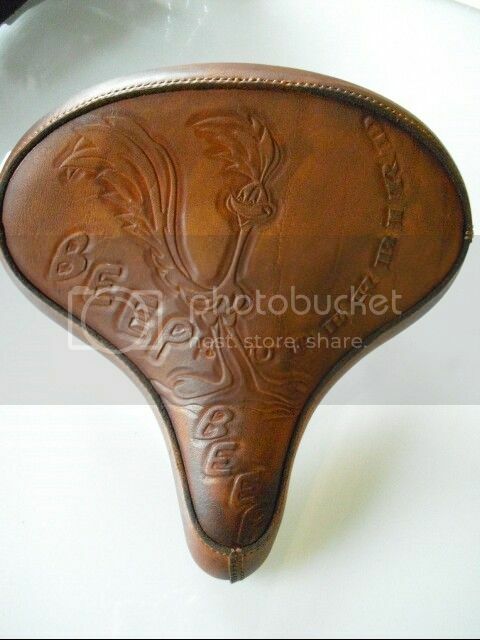 Reynolds invented this in 1936 and made it until just a few years back, when they finally decided to succumb to making newfangled rubbish, too. What few people know is that they still supply it, if you place a special order. 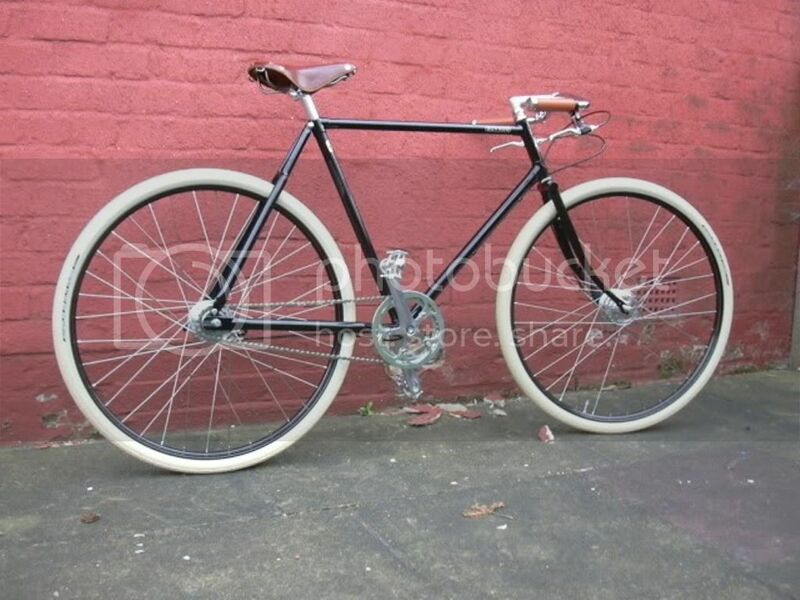 And Pashley did just that when they decided to build the Guv'nor. - The more thinwalled, the lighter the tubes are. 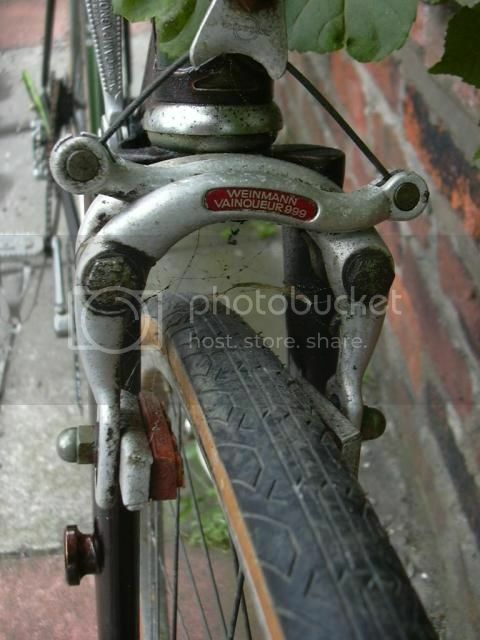 - Being thicker walled at the ends means they are strong enough for brazing them into the lugs without damage. 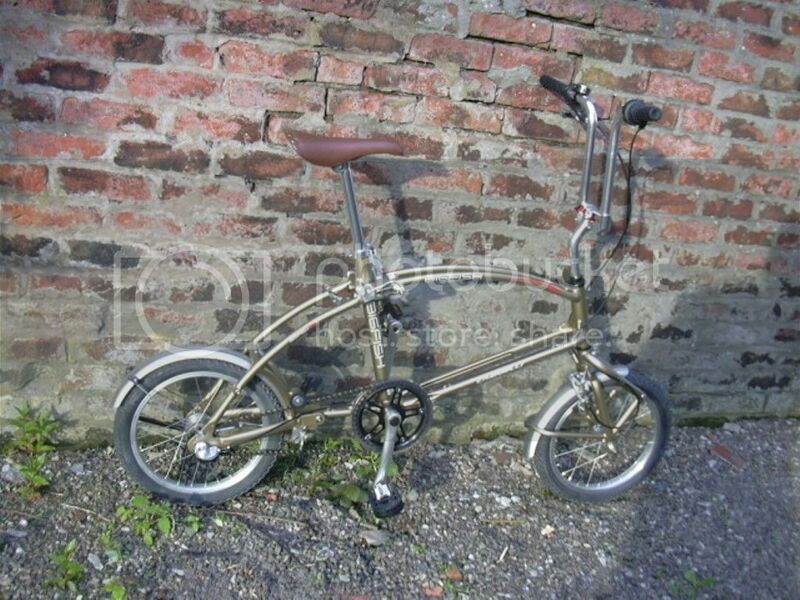 And hand-brazed the Guv'nor frame is. It is also stove enamelled. Actually, the Guv'nor oozes old fashioned quality out of every pore. It is the Morgan among Bicycles. 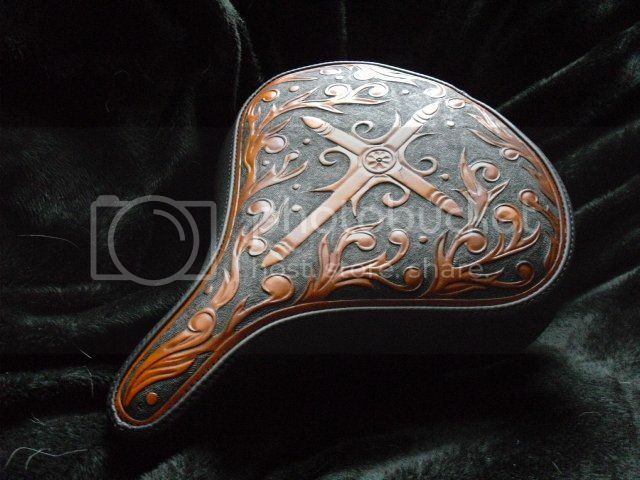 And like the Morgan, you have to place an order, and you will be on a waiting list. 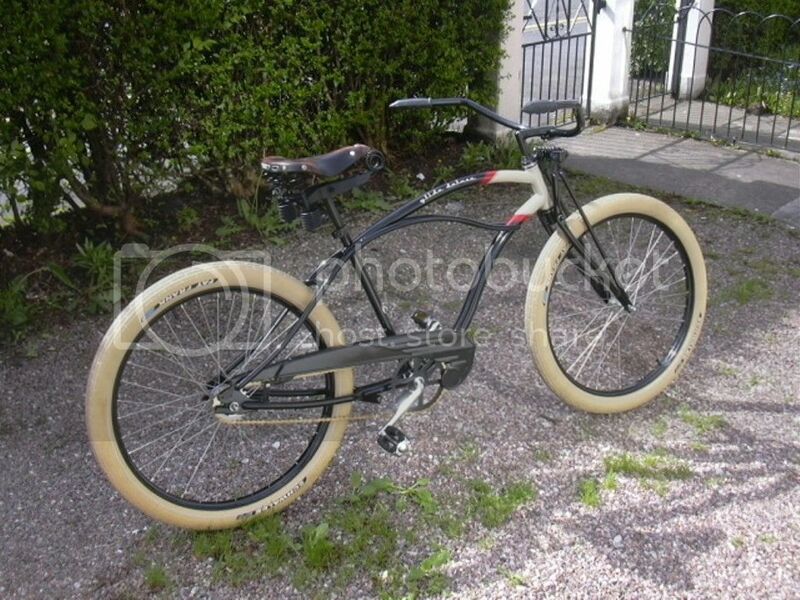 And no, exactly like the Morgan, the Pashley Guv'nor will never be discounted. 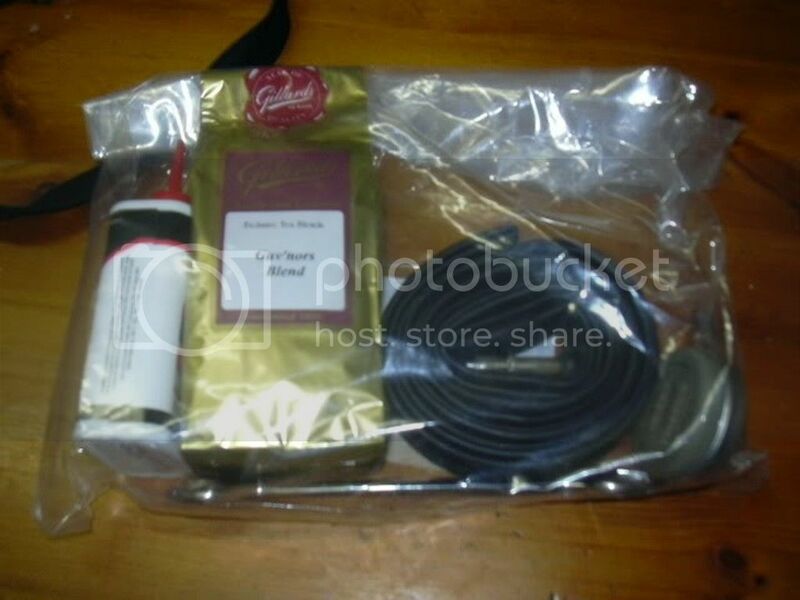 It contains a whole lot of useful stuff, like spare inner tubes, some cream for the saddle, etc. and some of the inevitable 'safety, you know' rubbish that can be dicarded straight away. 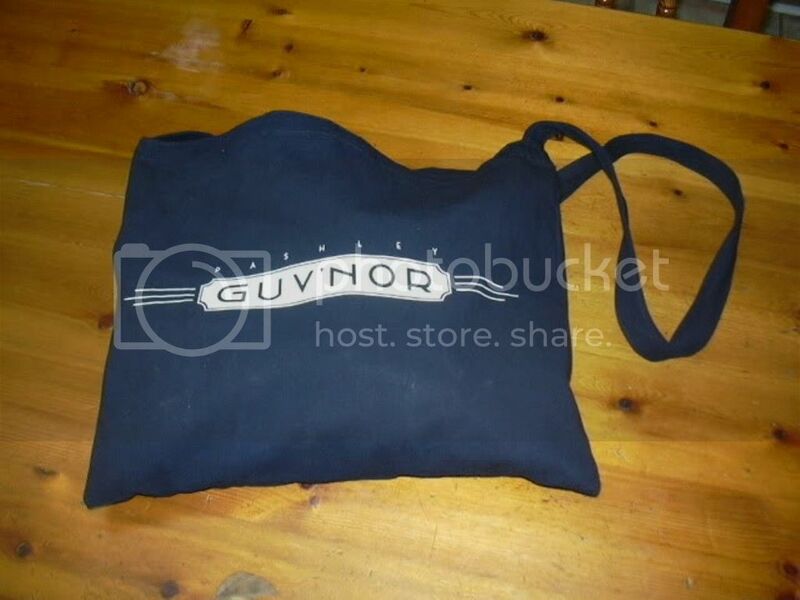 But the Baron was quite taken aback, when he found a bag of 'Guv'nors Blend' tea in it. 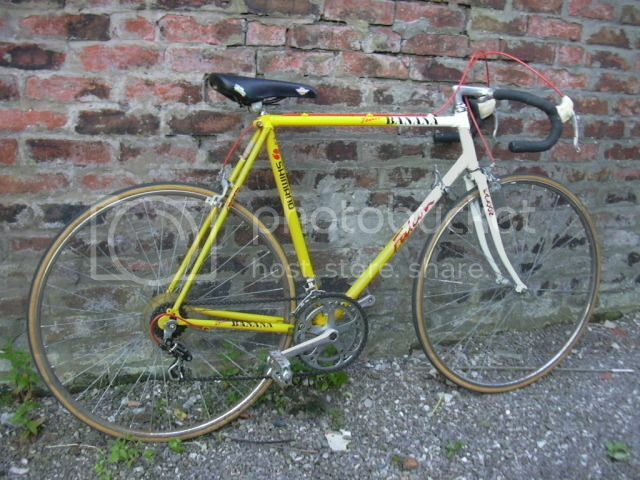 As far as the Baron can see, it is all original except for the saddle and the bar tape. 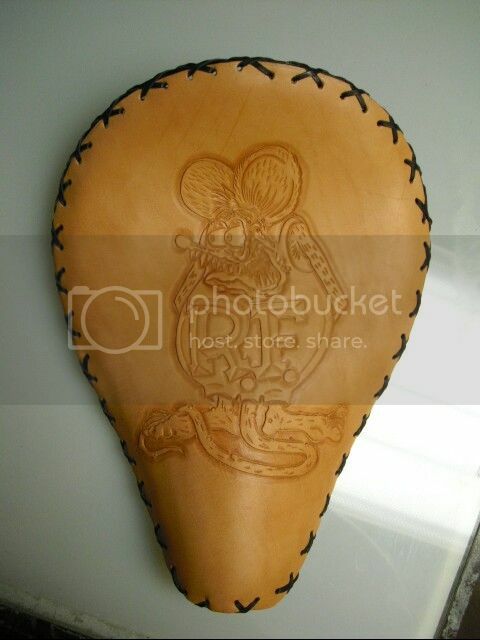 The saddle should be yellow, and the bar tape shaded from yellow to white. It looks like both are still available, as well as the set of stickers! So in theory, this thing could be restored to the brim! Frame: 1020 guage (Plain) steel 1" diameter dog leg rear dropouts. 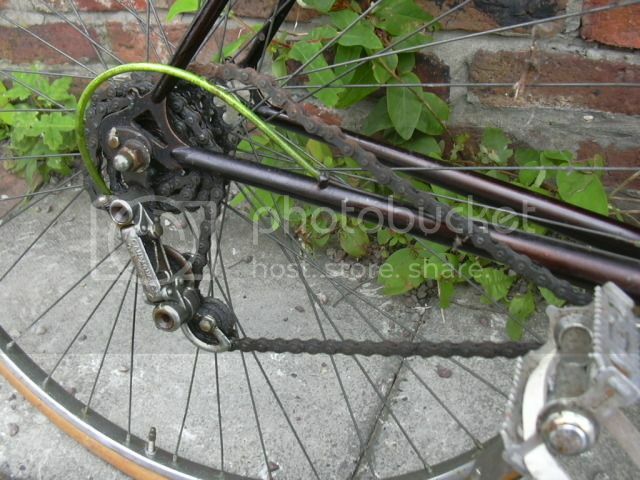 Brake Cables: Unknown but with original orange/red sheathing. Shifters: Shimano S.I.S thumbshifters on the down tube. 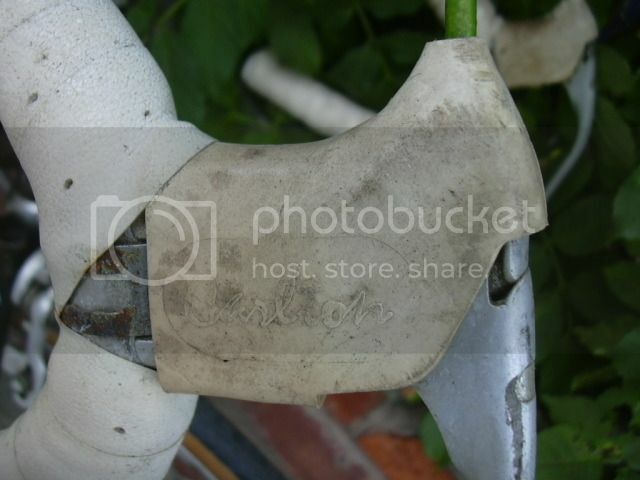 Derailleur Cables: Unknown but with original orange/red sheathing. Rims: Rigida Superchromix stippled plated steel. Now, the chrome is completely shot! I have never seen anything like it. Well, actually the Bigfish isn't that big. 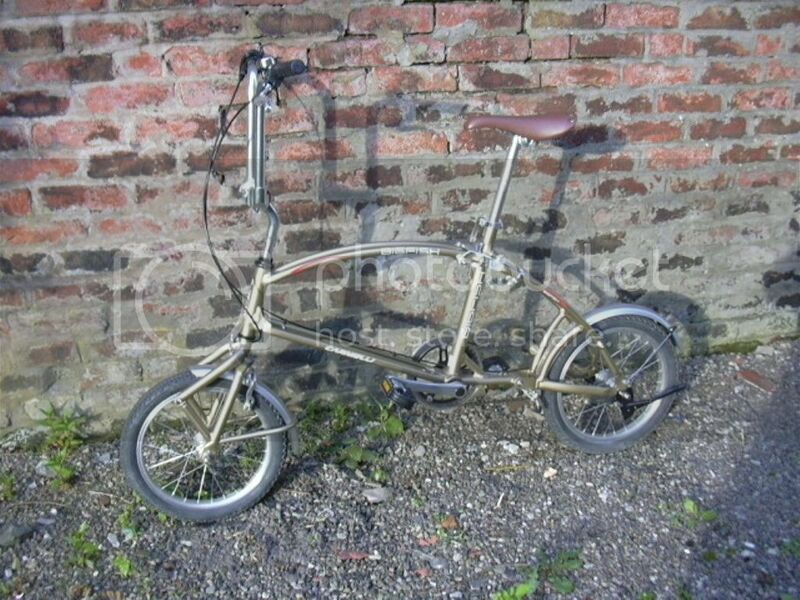 It is quite an ingenious folding bike, which was designed by a team in Slovenia and produced in Italy. For the Baron, it was love at first sight and he didn't rest until he could call one his own. Luckily he managed to secure the last one ever to be sold in England. Today's Spotlight Is On - - - - - - - Bali! Contrary to common belief, Bali is not in Indonesia. He is actually at his house in Hungary, tinkering with bikes. 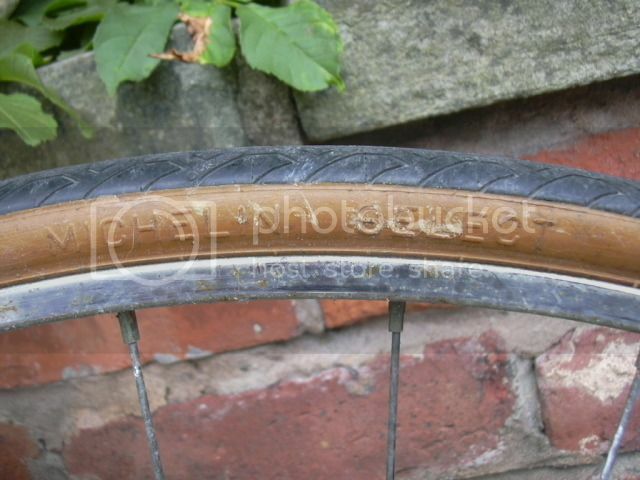 The tyres are Continental 42-635. 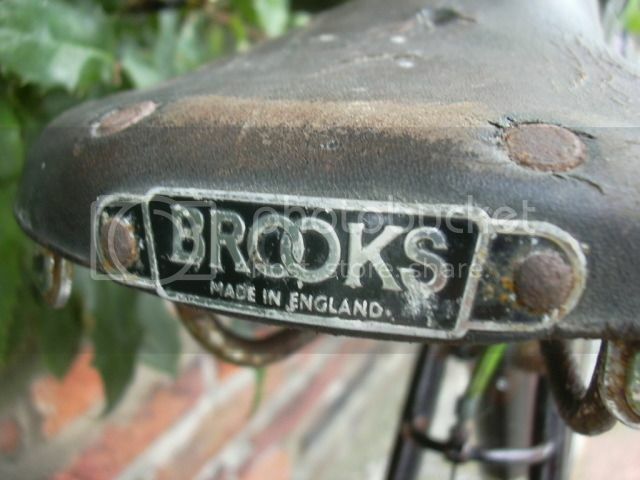 Other features are a Brooks Team Pro saddle and slender grips in honey, the crankset is a Sturmey-Archer FCT62 AA, and the drum brakes and 3 speed hub are Sturmey-Archer X-RD3 and X-FD respectively. What people carelessly discard never ceases to amaze the Baron. But in this case, he probably went a little too far. 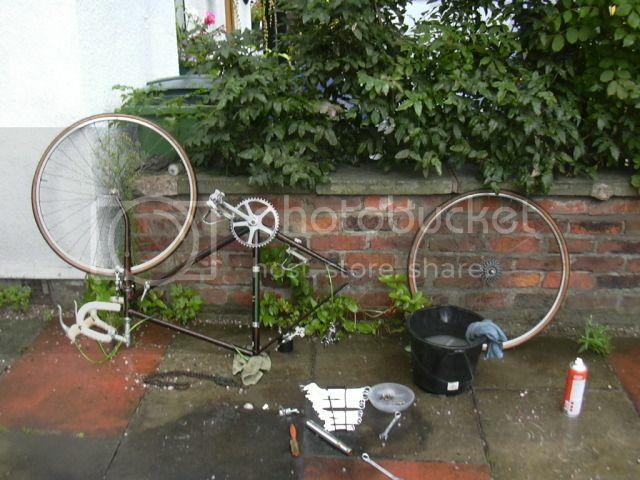 The bike appeared too far gone and beyond hope. 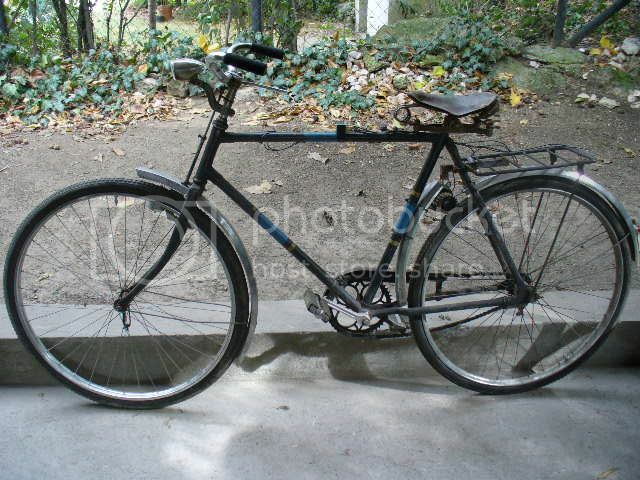 The term 'tip' crossed his mind several times, but sentimental as he is when it comes to old bicycles, he simply didn't have the heart to toss this heap. The little Baroness' face when she saw it: Priceless!!! The mods are subtle, but altogether the bike now looks more integral. 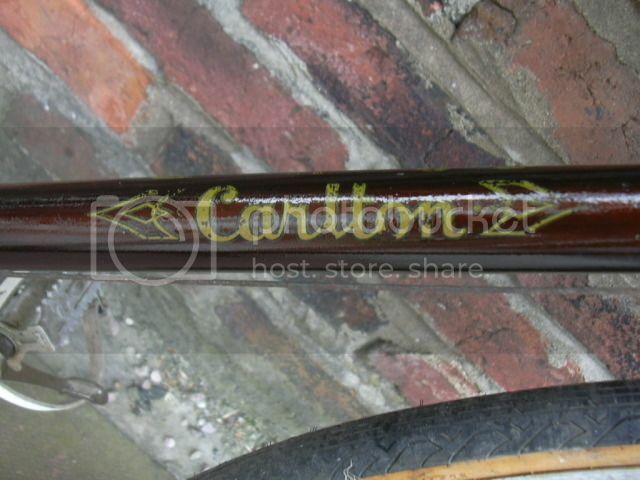 Both stems and the handelbar are now black. Sachs Torpedo two-speed Duomatic rear hub. Today's Spotlight Is On - - - - - - - - Crazy G ! From time to time, the Baron will use this blog to introduce his friends. 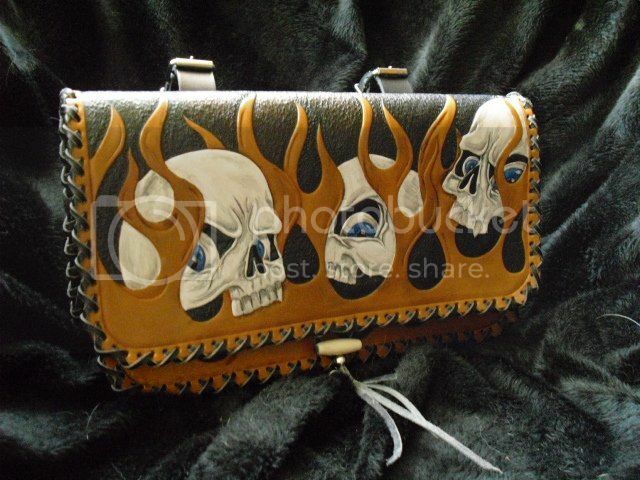 Today's spotlight is on Crazy G, who revives the dying art of hand-chasing leather. 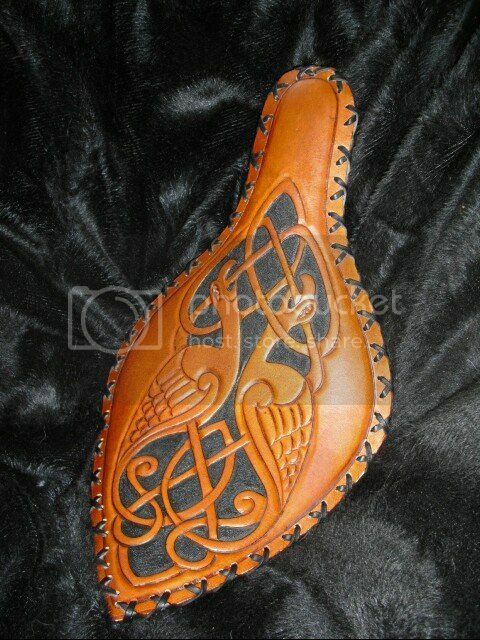 This is an incredibly labour-intensive art, all the patterns are carefully chased with small chisels and a hammer. Often, the patterns are then brought out in vivid colours. The stuff coming from her little workshop in Bremen never ceases to amaze the Baron. 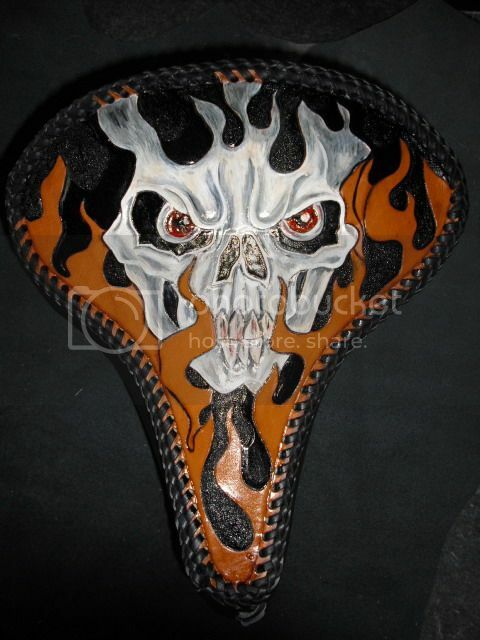 Crazy G has done work for award winning custom motorcycles and bicycles. 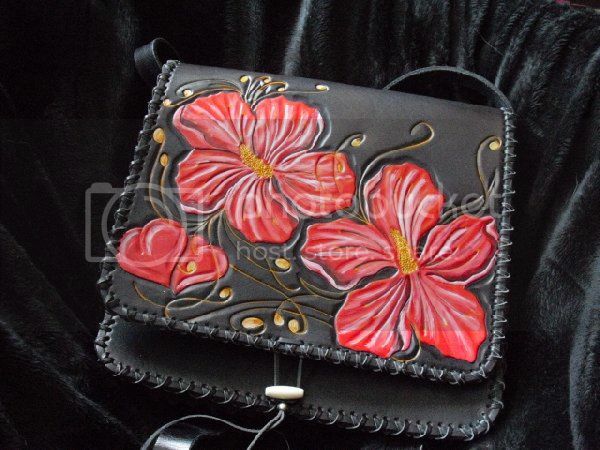 She applied her art to anything from furniture, boots, clothing, to horse riding equipment. Like many things in life, Baron von Zach Cycles is the result of a bet. 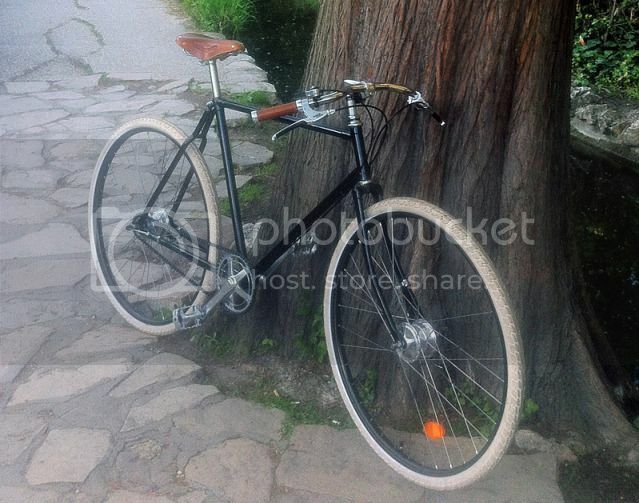 Many, many years ago, the Baron was on his way home from an excursio per potationis when he and a friend, both visibly intoxicated, stumbled upon an abandoned old bicycle in a park. The Baron, in a fairly optimistic state of mind, clearly caused by a refreshing set of countless stiff Martinis, said: "I can make this look cool". Of course, his friend held against it, which triggered aforementioned bet. 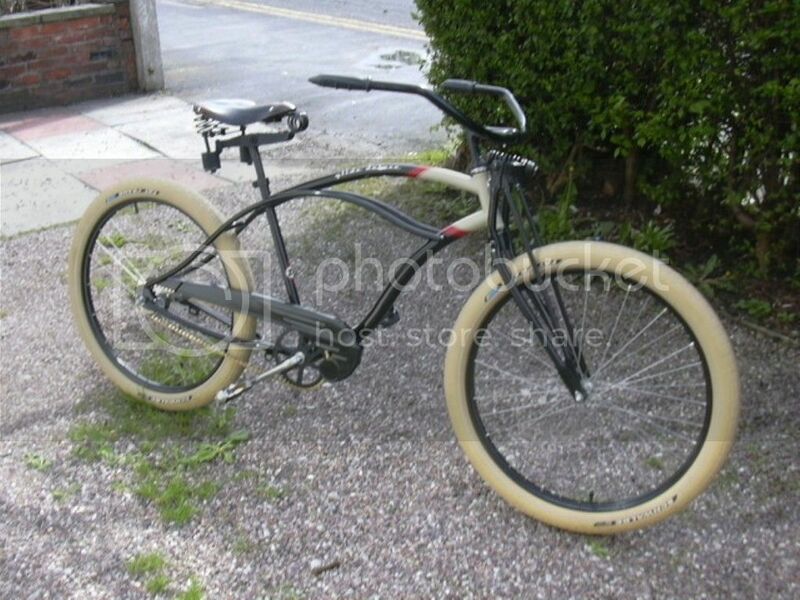 Since then, the Baron has not grown tired of making desirable bikes out of unwanted ones. 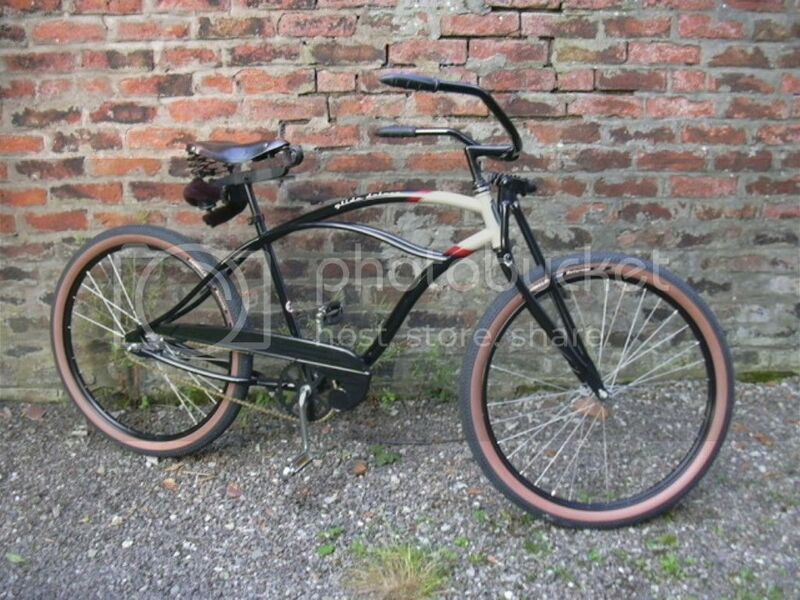 Later, he added American style Beach Cruisers to his portfolio. 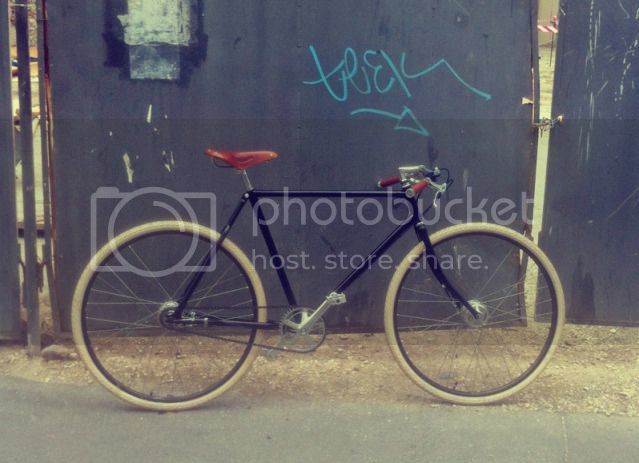 Baron von Zach Cycles hence offers the following services: - Refurbishing and modifying vintage bikes to customer specifications and taste. 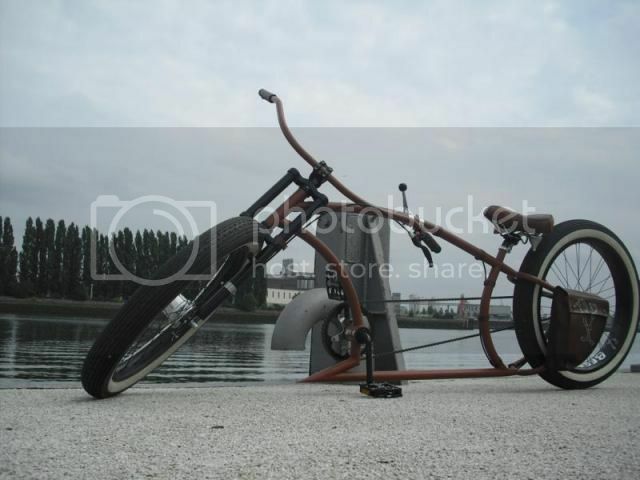 - Refurbishing, modifying, or building American Style Beach Cruisers. 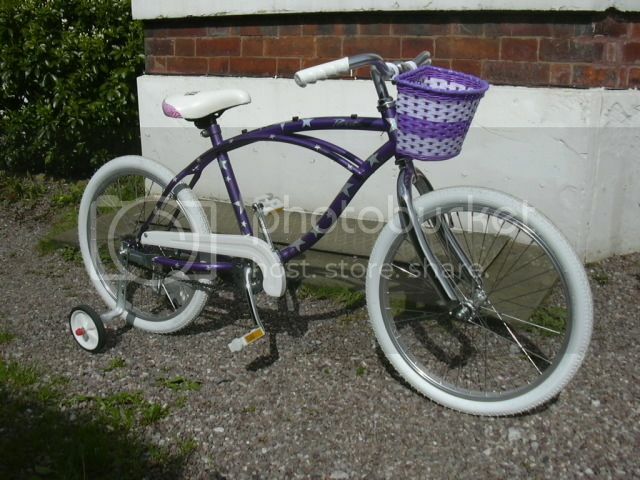 - All the above can also be done to bikes supplied by the client. 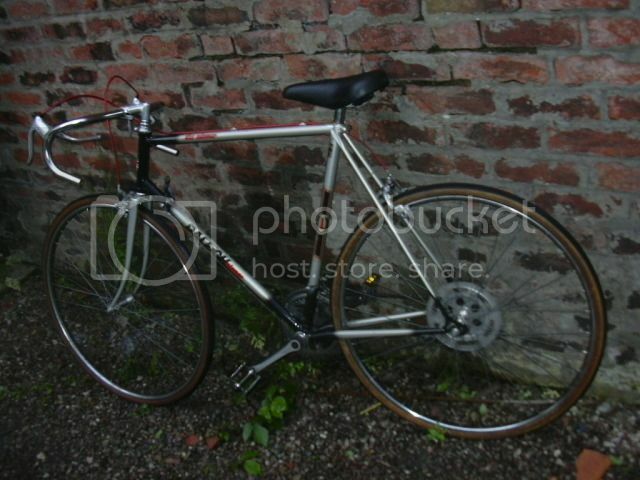 - Sourcing of modern or vintage bicycle equipment and accessories. 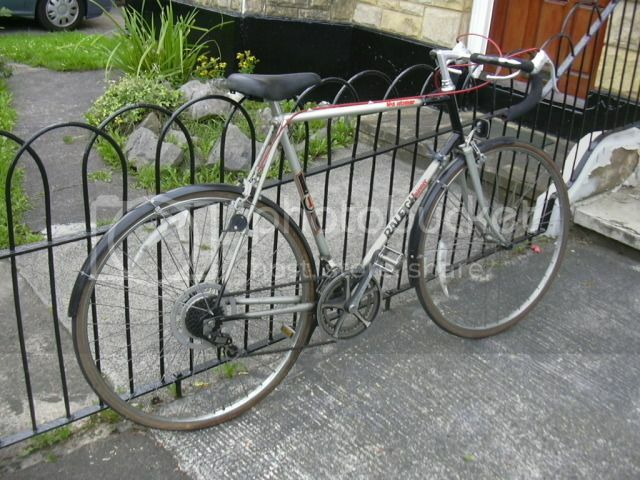 - Advice and information for people who want to have a go at bicycle restoration themselves. If you are interested in any of this, please feel free to leave a comment.